The long life spans in Genesis such as Methuselah living 969 years – were they real years or were they using a different calendar? There certainly are many long life spans listed in Genesis 1-11. Methuselah at 969 being the longest and most people lived around 900 years, with Noah being the last person recorded to live over 900 years when he died at 950 (Genesis 9:29). But there are also life spans after Noah that are long and show an interesting trend after the flood as man’s recorded life spans rapidly diminished. Noah’s son Shem lived only 600 hundred years and his son Arphaxad lived only 438 years, etc. By the days of Abraham, man’s life span was much reduced, with Abraham living only 175 years. Still a long time compared to us. By the days of Moses (roughly 3,000 years ago) who lived a mere 120 years (Deuteronomy 34:7). We should note Moses was the man who wrote our life span would be around 70 – 80 years unless God blessed us with an extra strong body (Psalm 90:10) and that is still the average today 3 millennia later. So are the Genesis 1-11 ages real years or were they using a different calendar? We can answer the question about the calendar fairly easily by discovering how many days they had in a year. Many have suggested they were using Lunar calendars and therefore 969 actually represents 969 Lunar months not 969 years. This would make Methuselah only 74.5 of our years at his death. Of course this argument does begin to look a little silly when you start applying it to Abraham since it would mean that Abraham lived only around 14yrs years if his 175 represents Lunar months. So how long were the Genesis years? We have a very precise account of one year of Noah’s life between Genesis 6 and Genesis 10. The year of the flood is the most detailed chronological year in the whole of the Old Testament as it represents a diary of events from Noah’s completion and boarding the Ark to his getting off the Ark. In Genesis 7 verse 11, it records that Noah was 600 years and 2 months and 17 days of age when the flood started. Then in Genesis 8:3-4, it records that when Noah was 600 years and 7 months and 17 days old, the Ark rested on the tops of the mountains and that this was 150 days after the flood had started. Given that we now have 2 comments on how long they had been on the boat, we now know that five of Noah’s months equals150 days. Therefore Noah’s months averaged 30 days each. It’s a simple matter therefore to realise that if 5 months equals 150 days, then 12 months roughly equals 360 days perhaps plus a few additions as we do for leap years, etc. So their year is provably, roughly the same as ours. Therefore, our friend Methuselah was 969 of our years – a really old man. There is a second way of checking what these age numbers mean, as not only are their life spans mentioned, but the age at which many of these patriarchs actually had their first child. So if we compare before and after the flood you find Enoch who having fathered Methuselah when he was 65 years old. If you divide that by 13 (the number of lunar months in a year) or even by 12 the number of calendar months – it would make Enoch roughly 5 years old when he had a son. It becomes even more ridiculous when you realise that Abraham’s grandfather Nahor had Terah at 29 years old. If these were only months Nahor would have only been 2.5 years old when he had his first child. An obvious impossibility. One last comment is perhaps worth making. Many so called evangelicals want to dismiss Genesis as real history until the days of Abraham, so they can avoid issues such as the long life spans. But with Abraham listed as living 175 years (Genesis 25:7), his son Isaac 180, and in the next generation Jacob 147 years (Genesis 35:28, 47:28), you can’t escape the issue at all. In the present world no one on record is living that long, so we have to face the issue head on! 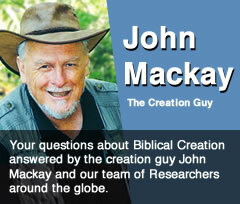 Long ages are faithfully recorded in Genesis as is a diminishing trend to the present. Man has devolved not evolved. 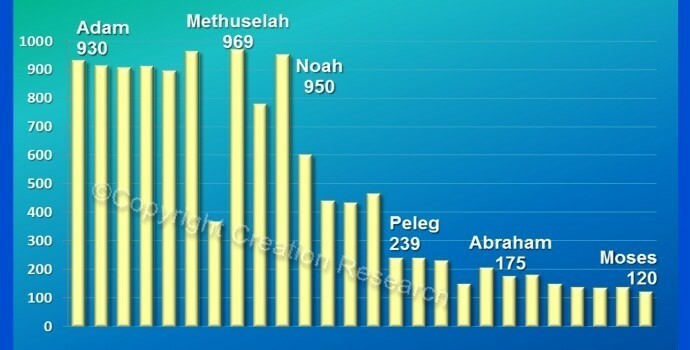 It is interesting to note the rapid decline in ages after Noah’s flood. But when you plot these you notice a second rapid decline that occurs after the tower of Babel (Gen 11 ff). It is most likely that the post flood decline is due to the total change in climatic conditions that occured as a result of Noah’s flood i.e. the effect of the coming of winter and summer (Genesis 8:22) along with the loss of so much carbon due to flood burial, and the as yet un-regrown plant life on planet earth which always has a major impact on climatic conditions. Add to this the collapse of the waters above which allowed massive amounts of high energy radiation that hadn’t previously entered earth’s habitat, along with radiation from newly escaped heavy metals such as Uranium that were now near the surface from the escaped fountains of the deep, so our mutation rate really increased. All these factors would have compounded to reduce man’s life span. But there is a second factor occurring that would show up in a few generations probably related to human breeding patterns. Present day breeding programs shows that whenever a gene pool is reduced, and a new population breed from a very restricted part of a previously much larger gene pool, then one effect of inbreeding is to produce a drop in life span. So starting from one family after the flood (Noah’s three sons) which produced offspring which later all intermarried, mankind has definitely been inbreeding since Noah’s day. This then was further compounded when each group separated at Babel and suddenly there was a new squeeze on the gene pool. Each family group leaving Babel now represented an even smaller fraction of Noah’s gene pool. In addition to producing very distinct family characteristics which would eventually give rise to the separate human racial groups, a second effect would have been to further reduce life spans. Now we are some 4,000 years in later 2012 and it pays to remember Moses’ warning concerning our much shorter life spans; “Lord teach us to number our days.” (Psalm 90:12) The reason is simple: It won’t be long before even the youngest reader of this answer has to stand before God and give an account. Make sure you are ready.